In 2017 we were commissioned by Aspire Defence for our specialist knowledge in erosion control. A large scale series of SuDS, detention basins, spillways and outlets are being constructed by Dyer & Butler for the British Army. Aspire Defence, the design engineers, made particular use of three of our erosion control products, including Rock Rolls, Rock Mattresses and our Shear Stress Turf. As a part of the scour and erosion control measures it was necessary to take large volumes of run off water from newly constructed hard standing areas. 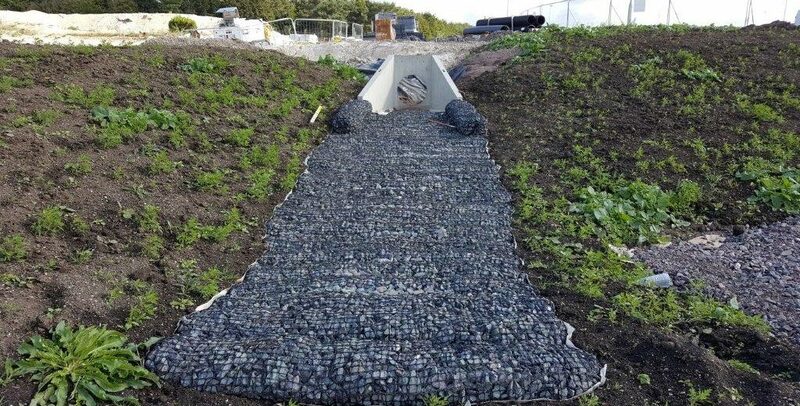 The outlets and the toe of the spillway areas are being protected with pre-filled Rock Mattresses and Rock Rolls, which are cost-effective revetments that are suitable alternatives to rock rip rap and gabions in many scour applications. Our rock products are superior erosion control systems as water only percolates through so that there is no scour energy to the underlying soils. This would not be the case with larger stone fill. They are filled with 40mm to 75mm stone so the water is slowed down and the small spaces between the stone trap sediments creating a good environment for plant roots to anchor. The Rock Mattresses will also prevent scour within the hydraulic jump zone of the spillway. The spillways within the detention basin are covered with Shear Stress Turf (SST) that protects the engineered soil and clay lining beneath. Shear Stress Turf is a unique pre-vegetated scour solution typically used in areas where forces exerted by water exceed the shear limits of other Turf Reinforced Mats from day one of installation. Rock Rolls are also used along the perimeter of the basin as protection and tieing in detail for the SST.